California's Proposition 56 Would Raise Cigarette Tax By $2 A Pack : Shots - Health News When New York increased its cigarette tax, smoking rates declined. California's proposed increase of $2 a pack may, too, say researchers. The higher the tax, the more likely people are to quit. Backers of California's Proposition 56 hope to hit people hard enough in the wallet that they quit smoking. Each time New York state increased its tobacco tax — now at $4.35 per pack of cigarettes — calls to the state's Quitline spiked. In New York City, then-Mayor Michael Bloomberg hiked the tax even more. "I was so angry with him, I could hardly afford it," says Elizabeth Lane, a Harlem resident who paid $12 a pack. "I had to beg, borrow and steal to get money to buy cigarettes." At first, Lane cut down to four packs a week from seven. But even so, she sometimes didn't have money to buy laundry detergent or toilet paper. Then in 2013, after smoking for 40 years, the price tag, her doctor's warnings and her daughter's guilt trips all came together. "I said, 'Lord, I've been waiting a long time for this. When will you answer my prayer?' " she says. "And he answered this time." Studies support the goal. For every 10 percent increase in the price of cigarettes, smoking goes down 4 percent, according to a 2014 report on smoking by the U.S. surgeon general. "Part of that is people quitting. 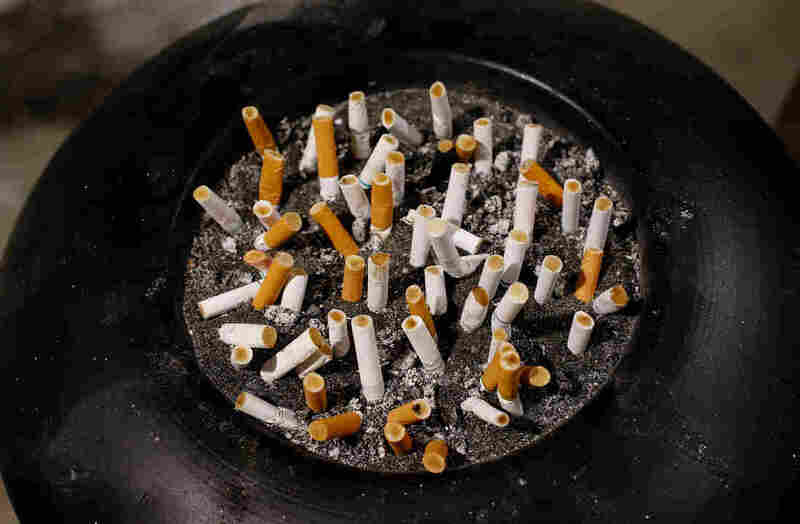 Part of that is people cutting down," says Stanton Glantz, a professor of medicine at University of California, San Francisco and director of the Center for Tobacco Control Research and Education. In New York City, smoking rates declined from 22 percent of adults to 13 percent in the 12 years after the tax, and a ban on smoking in restaurants and bars, was implemented. California's smoking rate is about 12 percent, the second lowest in the country after Utah. Most people in California who do smoke, Glantz says, don't smoke that much. "It may be that a price increase that will follow Prop. 56 will be enough to just get these light, intermittent smokers to just say, 'Forget it,' " he says. Behavioral economist Justin White, a colleague of Glantz's, says the vast majority of smokers wish they could quit. They know it's bad for them. But addiction is a powerful force. "There's this universal tendency toward immediate gratification," White says. The craving for a cigarette right now easily overwhelms fears of heart disease or lung cancer in the future. But, White says, a cigarette tax that is high enough can flip that. A tax evident at the time of purchase has the power to compete with the desire for a cigarette. "Increasing taxes is a way to really bring that back to equilibrium, the cost in the future versus the benefits now," White says. The question is, how much. He says a $1 or $2 tax is enough to sway smokers with a mild self-control problem. But for smokers with a strong addiction, the tax needs to be between $5 and $10 to work. Either way, White says, a tax is most effective when paired with support from a cessation program. And this is where opponents have been digging into Proposition 56. The "No on 56" campaign, backed by tobacco companies R.J. Reynolds and Philip Morris, has raised $56 million to defeat the measure. Supporters have raised $17.5 million. Opponents are investing in radio ads that say proponents "are telling us Proposition 56 is all about helping people stop smoking. But follow the money, and you'll find out that only 13 percent of the new taxes would actually help people quit." This is true. Of the $1.4 billion that Proposition 56 is expected to raise from the tax, 13 percent would go to the state's cessation programs. The rest of the tax money would go to Medi-Cal, the state's low-income health care program, which covers care for one in three Californians. But UCSF professor Glantz says that $100 million for smoking-cessation programs is enough money to fully serve all would-be quitters who need help. Opponents ultimately reject the tax, no matter how the revenues would be spent. "I'm opposed to every manner of taxing," says Steven Greenhut, Western Region director for the R Street Institute, a free market think tank that promotes limited government. "Let people make their own choices." He doesn't like that Proposition 56 would tax e-cigarettes, too. "Vaping is not entirely safe," he says. "But it's pretty clear that vaping is far less harmful than smoking." Early studies suggest that e-cigarettes may have fewer health effects than cigarettes. Still, in a proposal to regulate e-cigarettes that became effective in August, the Food and Drug Administration said that some studies have found toxic material in e-cigarette liquid and the exhaled vapor. But, the agency said, "we do not have sufficient data to determine what effects e-cigarettes have on public health at the population level." In any event, Greenhut says it's premature to tax e-cigarettes. For Elizabeth Lane in New York, the nicotine patch was her ticket to quitting. Now, she no longer huffs and puffs when she walks. "I can walk up stairs. I don't cough," she says. "And the circulation in my legs has improved." She says now she saves the money that she used to spend on cigarettes so she can buy birthday and Christmas presents for her daughter and granddaughter. "Instead of being on the receiving end all the time, you know, give me, give me, give me," she says, "I can give now." This story is part of a reporting partnership with NPR, KQED, WNYC and Kaiser Health News. WNYC's Fred Mogul contributed to this report.